Sophomore Ethan Flynn drives to the rim for a basket against Dayton. 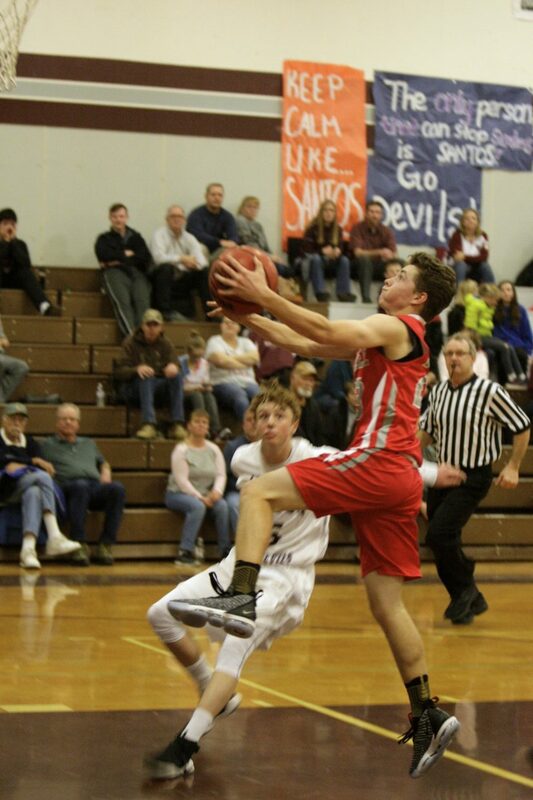 The Truckee boys’ basketball team suffered a third consecutive defeat on Tuesday, falling on the road 44-30 to Dayton. Ball security and poor shooting doomed the Wolverines on the night, resulting in the team’s lowest offensive output of the season. Truckee held an early 9-6 lead after the first quarter of play, but then went without a field goal until roughly two minutes remaining in the half. Sophomore Ethan Flynn ended the drought with a 3-pointer as part of a team-high 10 points on the night. Senior Joey Martinez responded for the Dust Devils by knocking down a triple of his own to give Dayton a 20-13 lead at halftime. The Dust Devils outscored the Wolverines 14-4 during the quarter. Junior Isaac Cruz opened the second half by getting into the paint and fighting through a foul for a basket. The ensuing free throw brought Truckee to within four points, but the Wolverines wouldn’t score again until midway through the quarter as Dayton went on a 7-0 run. Dayton senior Joshua Pasasouk would later hit a 3-pointer followed by a free throw to give the Dust Devils a 36-23 lead at the end of the third quarter. Pasasouk led all scorers on the night with 24 points. In the fourth quarter, Flynn hit a 3-pointer to cut lead to 10, but Truckee’s final few trips up the floor yielded nothing but several errant 3-pointers while Dayton extended its lead to 14 from the free throw line before the final buzzer sounded. Truckee senior Spencer Edmondson returned to the lineup from an injury and matched Cruz with five points on the night. Truckee (5-5, 0-5 Northern League) will next host Fernley (5-7, 2-3 Northern League) on Friday, Jan. 11. Tipoff is scheduled for 7:30 p.m.